Painting outside is exciting, and also difficult. I do not mind the heat, the cold, the rain, or snow, but painting in a lot of wind can be tough. 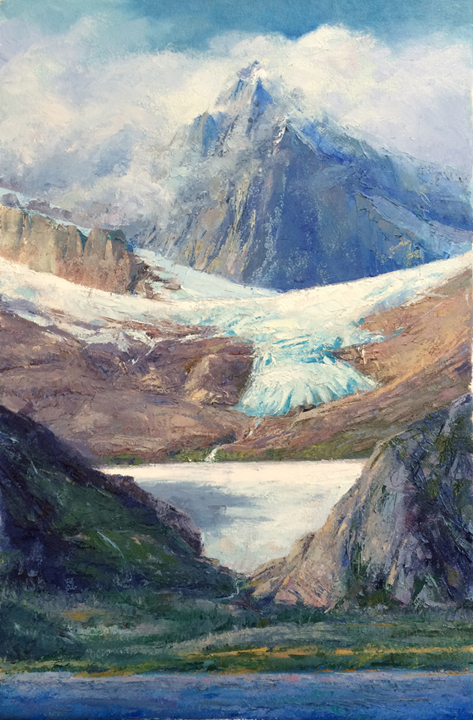 Here is a painting I did of a glacier in Chile. I TRAVEL A LOT TO GET IDEAS FOR BOOKS AND SOMETIMES JUST TO MAKE PAINTINGS OF DIFFERENT PLACES. RECENTLY I TRAVELLED TO THE COUNTRY, CHILE. Jason asks: Is Chile a nice country? Chile is a beautiful country! Here is a quick watercolor painting I made in my sketchbook. It shows the boat I was on sailing into a cove in Chile where there is a glacier. It was cold! Katherine asks:When you made the book PAINTER AND UGLY, did you make all the paintings at once or did you make them one at a time? That is a good question. I actually worked on them all together, that is, I did not just finish one and then move on to the next one. I did all the beginning stages together, then all the middles, and finally the details pretty much together. Here are the paintings for PAINTER AND UGLY as I was working on them in my studio. You can see my sketchbooks on the shelves- and my dog's pink "Queenie Bed" on the floor (she feels quite regal when snoring on her bed). Jillian asks: Have you ever made a horse book? I happen to be working on illustrations for a collection of horse stories right now. Actually, I once did a unicorn book called THE BABY UNICORN. It has unicorns, dragons, and even a little bit of magic in the story. It was very popular. That's almost a horse book, right? Zack says:I like the book PAINTER AND UGLY. Is it easy to get lost when you are mushing dogs? It is a challenge for me! Aidan wants to know: Do you have a favorite painting in the book PAINTER AND UGLY? Umm... I actually like all of them. But I had a lot of fun painting the dogs barking and jumping at the Junior Iditarod race start! Sari asks: Do you draw a lot? Yes, I do draw a lot. I draw in my sketchbook every day and do a lot of practice drawing. That's how you get better! Karin wants to know: What exactly is a sketch? A sketch is a quick practice piece for the finished piece of art. It lets you see how certain things look before you go through the time and effort of a whole finished piece of art. A sketch may be done with a pencil, pen, watercolors, crayons- anything. Below is a pen drawing sketch I did for the page in PAINTER AND UGLY in which the two dogs meet again during the race. Kira asks: When you made the book THE PERFECT SPOT did you really go under a waterfall? Yes, my son and I really did go under a waterfall for THE PERFECT SPOT. I had to know what it would be like before I could paint it! Yes, some of my books are published in other countries. Here is AKIAK as published in South Korea. Sam asks: Do you ever make books for readers in countries other than the USA? Well, I make my books for everybody, everywhere, but they are usually published first in the United States. Sometimes publishers in other countries buy the "rights" to publish a book of mine in their own language. Here is a book I illustrated, written by France Ward Weller, called THE ANGEL OF MILL STREET. The edition here is published in Greek. Miriam asks: What zoo did you go to in order to see real Tasmanian Devils? I did not go to the zoo to see them – I went to Tasmania (part of Australia) to draw them in the wild! Bill asks: Why do Tasmanian Devils run around in circles all the time? Actually, Bill, when I was researching the book LITTLE DEVILS in the wild areas of Tasmania, I saw lots of Tasmanian Devils. But I never saw any Tasmanian Devils running around in circles. They do run and travel far when looking for food in the wild, though. The only place I have ever seen them run in circles over and over is in zoos. Maybe when they are in a caged area, they still need to run and so they run around the cage. Or maybe they get stressed. Shannon asks: DOES YOUR DOG PULL A DOGSLED? No, but she likes to chase squirrels. Sara asks: In the book PAINTER AND UGLY, what happens after the race? ....and then maybe they run away! Yes, I did. I drew on paper and cardboard and garbage bags and napkins and on our upstairs hallway wall (got in a lot of trouble for that). One day my second grade teacher gave me a "Marble Pad" and suggested that, if I drew in it, I wouldn't lose my drawings because they would all be in one place! So I began my first sketchbook. I now have 118 and I know where all my drawings are. No, I am the only one. I am also the only left-handed person in my family. Curt from Springfield asks, "WHERE IS YOUR FAVORITE PLACE TO DRAW?" I like to draw people at airports and restaurants.